Illuminations is not the final exhibition in this project. It represents a stage in our evolving collaboration. It is as much an opportunity for us to test out ideas for ourselves as to show finished work. Given the nature of this approach, it’s fitting that the venue for the exhibition is the gallery / project space area of Digswell Arts’ artist studios. We will be showing photography and mixed media and plan that it will be as much an installation as an exhibition. We will be working part of the time in the space and adding to the work as we go. Sally has written a couple of blogposts about some of our studio work on her blog here and here. Our plan is to work towards a series of exhibitions in 2019, for which we will publish details nearer the time. Sally and I de-installed Hidden yesterday with mixed feelings. It was a beautiful day at Wicken Fen and we enjoyed seeing how the work had been affected by almost a month exposed to the environment of the hides. We photographed the work before we took it down. Paper had buckled, wrinkled and come loose. Rain had left water marks. Sunlight had faded exposed areas and altered colours. We found insects sheltering in folds or layers. And spiders had built their webs around and behind the work. It was beginning the process of becoming part of the fabric of the hide and it would have been fascinating to leave it there. It was a bright, windy day and we were distracted by the effects of sunlight flickering through the holes in the walls of the hides. In Charlie’s Hide we stood for some time, filming one flickering sunspot on a piece of painted acetate we had taken down and laid on a bench. Sally filmed it flickering like a flame on the palm of my hand. In East Mere hide I photographed the patterns made by the sunlight shining through cracks and gaps in the walls. Taking down the installations marks the end of this project. But not the end of our collaboration. It’s time to pause and take stock but we are thinking about the next phase. In the meantime, we both have other projects. Sally will be teaching for FibreArts Australia in July. Some of my work from the exhibition in Ely will be included in Bircham Gallery’s Spring exhibition starting on 19 May. And a separate group of work, Thorn, will be going to Gallery 57 in Arundel for A contour, a curve - the lie of the land. Sally and I met on Friday to review our work and discuss exhibition preparations. We spread our work out on the floor and had a critique session. I can't share pictures - we were too involved to take many anyway - but I am excited to see all our work coming together. And it was revealing to see both the differences and the similarities in our response to the same source material. We both still have much to do and our deadlines our almost upon us now. There is a mass of administrative preparation to do alongside finishing our work. One of those is publicity, so above is our flyer with details of the exhibition. There will be two elements to this. The first is a gallery exhibition at Babylon Gallery in Ely, Cambridgeshire. The second is an art trail at Wicken Fen itself - Sally and I are thrilled that the reserve managers are willing to let us create some installations in some of the hides at the Fen. The hides have turned out to be an important source of inspiration for us - more on that another time. In the meantime, a few glimpses of what's been going on in my studio. The throwing back by a body or surface of light, heat or sound without absorbing it. The physical law of reflection states that the angle of incidence equals the angle of reflection - if a wave hits the surface at 36°, it will be reflected at 36°. When light waves hit smooth surfaces the waves are reflected uniformly and can form images. Rough surfaces, such as moving water, scatter light in all directions – but each tiny bit of the surface still follows the rule that the angle of incidence equals the angle of reflection. Materials may show a mix of these behaviours, with a proportion of light being absorbed, transmitted or reflected according to the properties of the material. If light waves strike the surface head on, i.e. at 90°, they will go straight through and come out the other side. There is a critical angle at which light will no longer pass through the surface but be reflected. is virtual – it appears to be behind the mirror. The word mirror comes from Latin mirari – to wonder or marvel at. The Latin word for mirror, speculum, is related to the verb to speculate. Many beliefs associate mirrors with a capacity to reveal the essential nature of a thing – its hidden or potential qualities. Self-knowledge – what we see may depend on our receptiveness or resistance to the insights offered. The sense that beyond the mirror-image of immediate reality might be something quite different. Passivity – the surface reflects the thing but is unchanged by it. There is something about the image cast on the surface of the water, but not being part of the water. The image can be very distinct but is unreal, insubstantial, ephemeral. It is disrupted by any movement of the water or change in the light. Plants growing in the water cover or pierce it, disrupting your sense of figure and ground. It is a reversal of reality. It is a trace that cannot exist without the object it reflects but has no physical substance of its own. And yet, on the fen, it can sometimes present you with a clearer view of the things edging the water. I photographed hundreds of reflections on our visits. It sometimes made for slow progress along the lodes or drainage ditches when the conditions were particularly good for this. These photographs have become the basis for much of my work for the exhibition. Reeds or rushes dominate because they are what is most often reflected. But the variety of marks and forms I collected is significant. Initially I chose some of the clearer and more realistic images, but used printing techniques that introduced distortion. Later I introduced more distorted images that are more obviously reflections. The fragmentation and dissolution of the form reflected in the surface create a pleasing ambiguity. The resulting work is the most figurative I have ever made; but is constructed entirely from abstractions, reflections, rather than images of the reeds themselves. 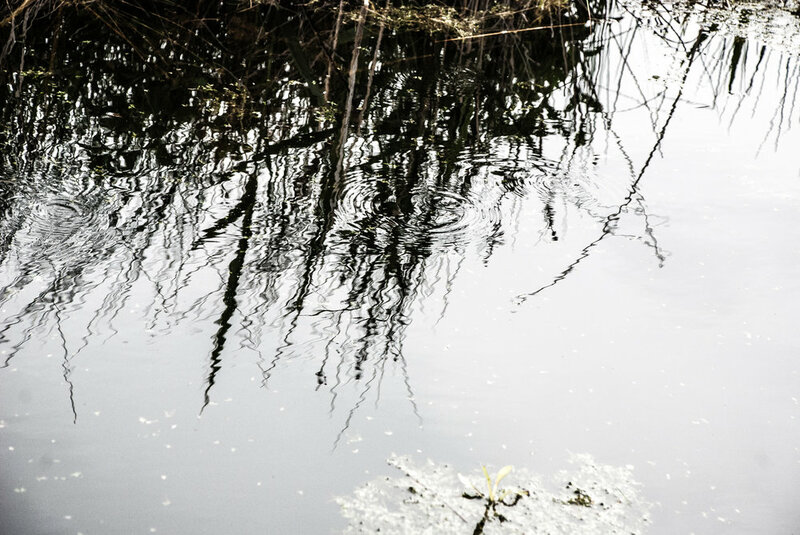 The purpose of these repeated visits has been to experience the Fen at different times and seasons and allow ourselves to be led in new directions in response. We have used drawing, photography, talking and writing to record impressions and develop our ideas. That movement from gathering information to developing work is a difficult phase and this time at least I just didn’t want to blog about it. My ideas shifted over the course of the project and it was better to let them evolve in private. So, here we are, less than two months until the exhibition, my studio filling up with work, and perhaps now it is time to talk about the main themes that I have homed in on. Let’s start with the reeds. When I think of the fen, I think of the reeds. They are found everywhere and no matter what time of year you visit they set the character of the fen. When Sally and I first visited in early summer 2016, I was dismayed by the tall, thick stands of bright green reed that covered the fen, obscuring views of open water. At the height of summer, they close you in – you cannot see over or through them in places and you may even have to push through them where the path narrows. And the greenness merges into all the other greens, although the dark purple inflorescences are amazing. But as the year progresses, the leaves fall, the stems slowly bleach and the low sun turns the seedheads pale gold and then silver. The fen opens out again and is filled with light. 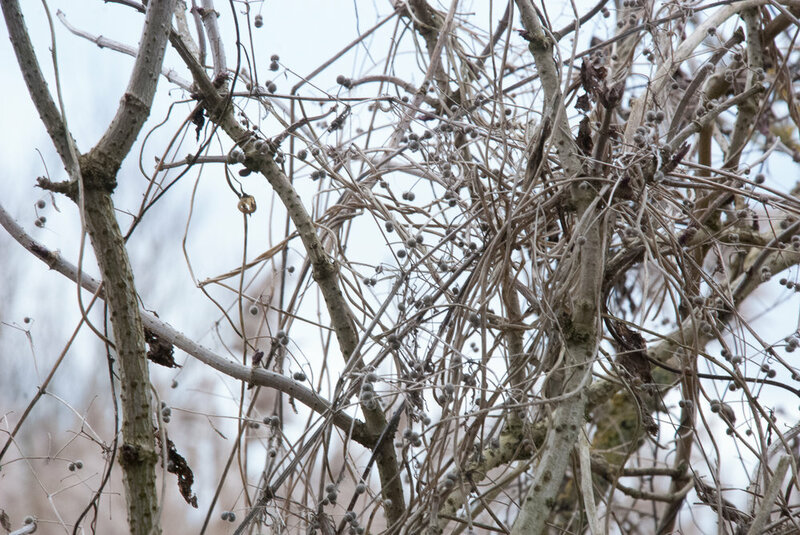 The silver reeds contrast with the charcoal greys of winter trees. It is more monochromatic but this is how I like to see it best. The sound changes too – from a soft, swishing whisper in summer to a dry rustling or crackling in winter. At some times and in some parts of the fen it is almost the only sound you hear. 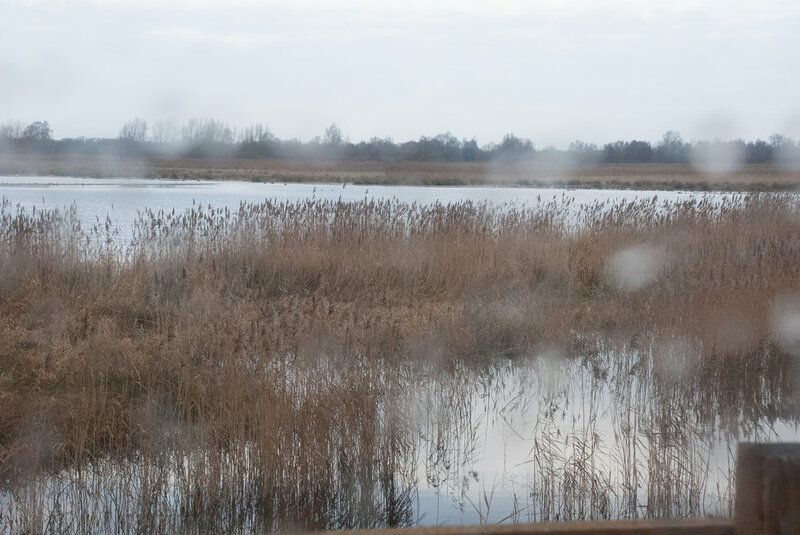 Often you also hear, though you may only glimpse, birds moving through the reedbed; while marsh harriers (or even hen harriers) glide over the top, hunting; and in the evenings flocks of swallows (summer) or starlings (winter) swoop over the reeds before settling to roost. I also love the sight of midges caught by the sunlight over the reeds - like gold dust. Phragmites australis (illustration by D A Showler from "Wicken Fen: the making of a wetland nature reserve"). Reedbeds are essentially swamp and a transitional habitat between land and water. If the water is too deep aquatic plants have the edge; too dry and herbs and shrubs take over. At Wicken Fen a programme of cutting and burning is necessary to prevent the transition from reedbed to scrub and close monitoring and manipulation of water levels is essential to keep the fen wet but not too wet. What seems such a “natural”, unspoilt landscape actually depends upon human intervention to keep it in this transitional phase. 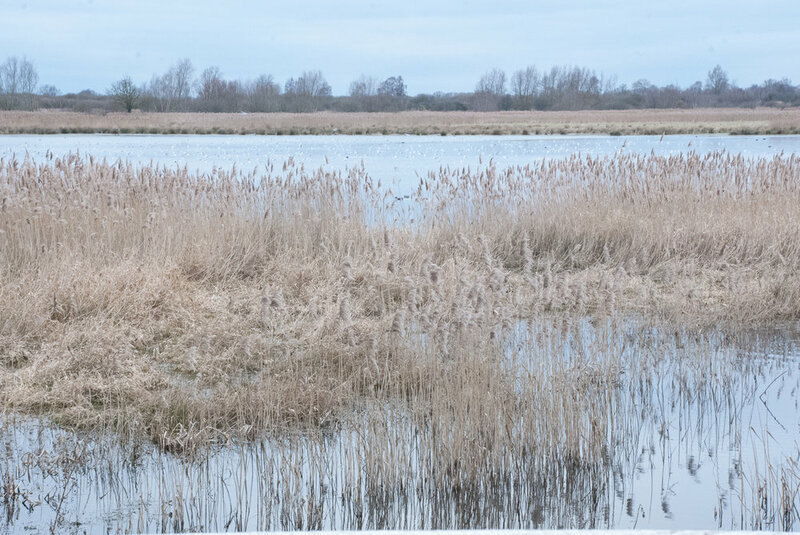 Reedbeds offer a diversity of habitat that is extremely valuable for birds and insects. Some British birds only breed in reedbeds and common reed supports a dazzling variety of invertebrates in every part of the plant. “Some of the rarest creatures on the reserve are also the smallest and least visible” is a remark made by one of the Managers at the Fen, that has stayed with Sally and me. The reeds dominate the landscape, habitat, appearance, sound and colour of the fen. They are a plant of the edge, neither land nor water, and constantly seeking to advance in either direction. Seen vs unseen - they are highly visible but there is even more that is hidden. They have "secrets" in the form of invertebrates that live or breed within the plant or birds or mammals that hide in the reedbeds. Light and colour - as ever I prefer the winter colours. Particularly the effects of the light in autumn and winter. Reed imagery is featuring in most of my work, but I am particularly interested in the reflections they make in the water. More on this later. Sally and I squeezed in another visit to the Fen last weekend. A shorter visit than our previous ones but we are keen to make the most of what remains of the winter. The weather was duller than had been forecast but at least it was mild. The Workshop attached to the Fenman’s Cottage was open and so we went in to explore. The 18th century cottage was inhabited until the 1970s when the National Trust acquired it as a rare survival of a vernacular Fenland building. The workshop was filled with tools and examples of Fenland crafts. Tucked amongst all these were a collection of animal skulls and, bizarrely, a stuffed mole poking its head out of an enamel mug. It was hard to take good photographs in the low light without a tripod. Sally and I were drawn to the collection of old photographs pinned to one of the walls. The photos were faded, speckled and curled with age. We were interested in what this did to the images. Constrained for time, we headed towards Baker’s Fen which was less busy than the main part of the reserve. This time I was concentrating on the colours of the fen. On this overcast February day, the overall impression was paleness. Bleached reeds, withered leaves, silver water. The reeds have a warm red undertone but everything else is a cold grey. A pile of freshly cut willow on the other hand was blue-green and rust. A short-eared owl glided over the reeds, stopping us in our tracks. Its feathers matched the fen. I deliberately over-exposed some of my photographs. This exaggerated the paleness, removed detail and created more abstract images. The results remind me of the faded photographs in the fenman’s workshop. I left home early in an attempt to reach the Fen by dawn. Winter mornings, especially if there is mist or frost, can be lovely. But this was a grey, drizzly January morning, so it probably didn’t matter that I arrived later than hoped. In summer the fen felt closed-in, opaque and overwhelmingly green. You couldn’t see past the lush vegetation. Now, it feels as though the landscape has expanded and opened out. I can see through bare twigs, reeds and trees. 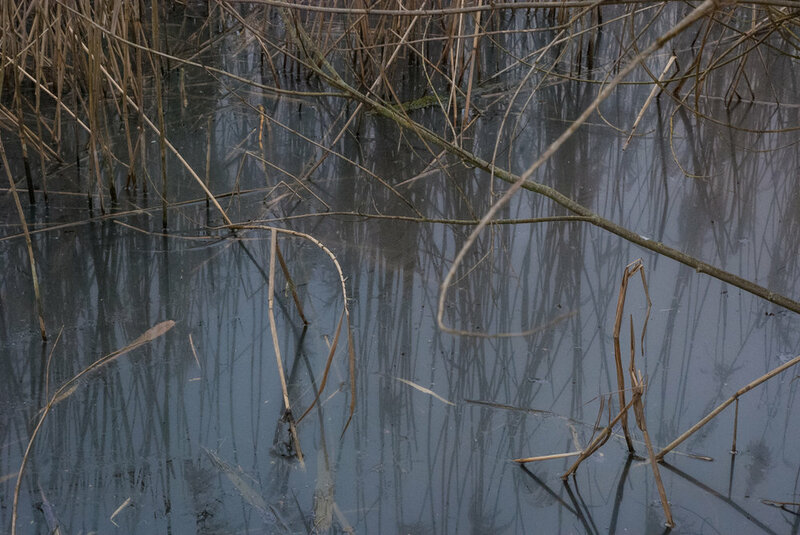 Areas of open water that had been totally obscured by the reed beds, reflect light even on a grey morning. The colours are winter greys accented by acid green or yellow (lichen, moss), pale blue (water, sky) and warm golds or ochres, where the sun catches the leaves. This time Sally and I explored the southern part of the reserve to the edge of Burwell Fen. Winter crops were pushing through adjacent fields – undulating, dotted lines of emerald green against indigo-black soil. In places, vine-like plants have twisted and wound themselves together to create dense, matted coverings over fences at the edge of the paths. A little surreal. I particularly liked the contrast with the reeds behind. We remain interested in the hides and found two new ones to explore. Once again I was interested in the way reflections in the windows disrupt or overlay the view. 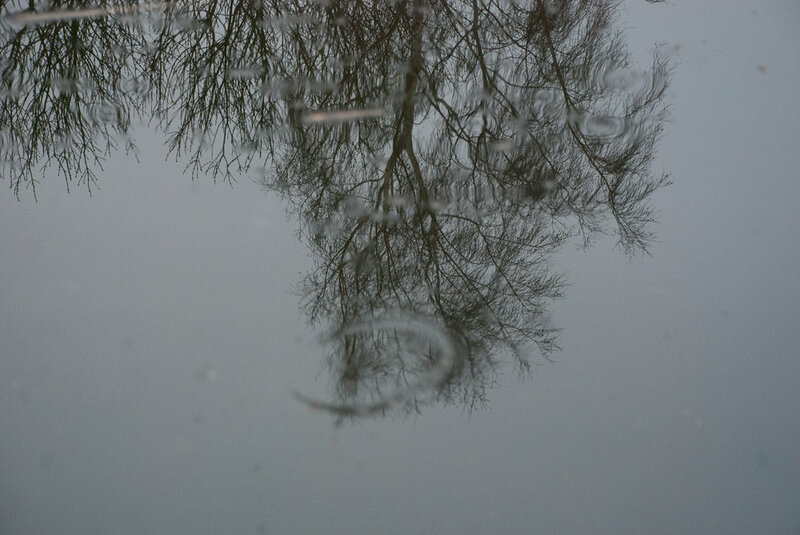 Taking photographs through rain-spattered glass resulted in some impressionistic images too. But the main thing that excited me on this visit were the reflections in the water. These varied according to the light, the water quality and any disruption in the surface. 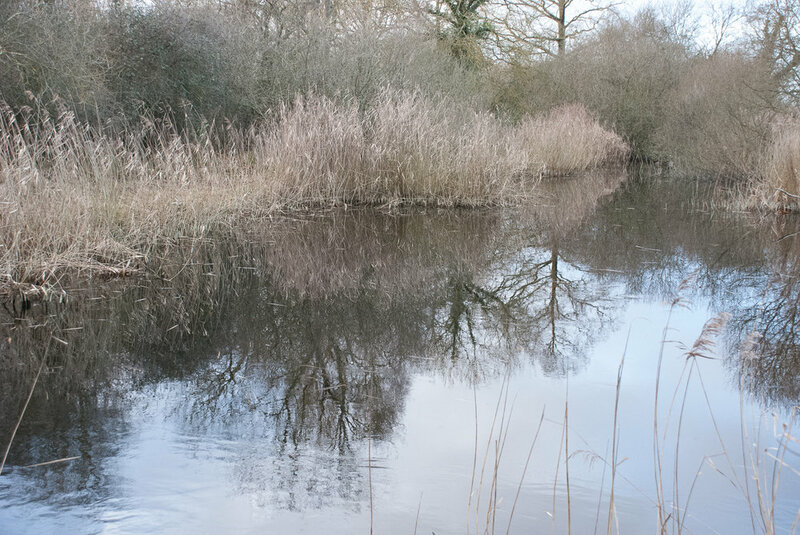 My favourite was one ditch where some disturbance had turned the water a milky blue-green, the perfect background for the shadows and reflections cast by the willows and linear marks of the reeds growing out of the water and fallen branches. In the afternoon the sun emerged and turned the surface of Wicken Lode silver. Trees and reeds on the opposite bank were reflected up side down while reeds in the foreground cut across these images. Monochromatic, linear images. Positive and negative space. There is something about these images cast on the surface of the water but not being part of the water. The reflection can be so distinct but is essentially unreal, insubstantial, ephemeral. They are an indirect way of looking at the original. And a reversal or distortion of what's there. Some are so clear that my photograph could be taken for the original. But I like those where there is just enough disruption to make you question what you see. Sally and I made another visit to Wicken Fen earlier this week on what turned out to be an uncomfortably hot day. There is little natural shade, there was virtually no breeze and, although the hides provided some shelter, as well as being hot they were also stuffy! Not the most comfortable conditions for our third research visit, but we did our best and stayed until evening, drawing and taking photographs. By 7pm the light was glorious and golden … and the heat was finally relenting. The Fen is still overwhelmingly green. The reeds and sedge have grown up above our heads in places so you cannot see over but are left to peer through. The leaves on the willow, alder, birch and hawthorn look dull and tired. To me, all this foliage is a barrier – it conceals the underlying structure and I find it rather uninteresting. I am impatient to see the leaves off the trees and all the greys and browns of late autumn and winter. But greenness is so characteristic of this place that I may need to make peace with it and see what I can do. I don’t think I wrote about our second visit, but every time we’ve been so far, Sally and I seem to be drawn to the hides. We have been photographing through the holes in the walls and the slit windows. One hide has opaque plastic windows and partly conceals the view in a way that interests us. Other visitors were clearly bemused to find us kneeling on the floor pointing a camera at a hole in the wall or drawing what we could see through a closed window! I am interested in how the hides cause you to see the Fen in sections or fragments. Pursuing this idea I took a small mirror with me this time, propped it against the window and started photographing the reflection. What really interested me though was the juxtaposition of the reflection and the view through the window – and in some cases a secondary reflection in the window too. The result is a combination of landscape fragments that is definitely something to explore further. I seem to be both revisiting ideas from earlier this year and investigating new ones. I’m working on two separate strands at the moment and they each present a different challenge. In the first, I’ve gone back to the themes and techniques I worked on for my exhibition in February. 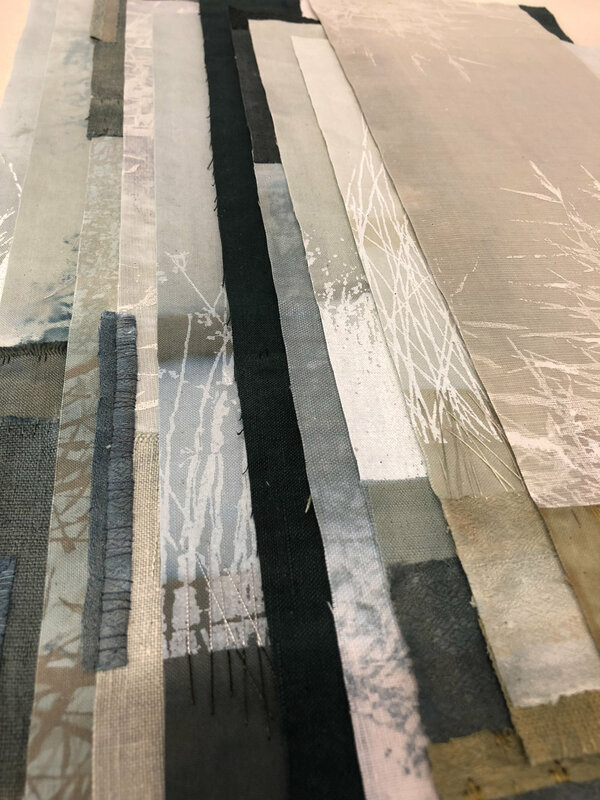 There were lots of loose ends – things I wanted to take further – so I’m starting to develop a new series of prints in the Between the Lines and Transience series. I had to overcome a surprising reluctance to this. Having done so much work before I think there was a sense of going back over the same ground. I didn’t want to repeat myself. But of course it doesn’t work that way and as soon as I actually started working on this again, new things emerged. New marks, new thoughts. It’s like my daily walk – when everything is so familiar I can take it for granted. But when I pay attention, there is often something I hadn’t noticed before or something I hadn’t expected to see. The other strand is the work I’m doing on the Wicken Fen project. This is very different. At the moment everything is exploratory. Sally and I have now made two visits to the Fen and I am playing with my photographs, drawings and making collages. I have no idea where I’m going yet. Well, perhaps I do, but it’s too soon to tell whether it will lead somewhere. I'm reluctant to share too much yet. These images give a flavour of how I'm working but none of them represent a fixed idea at this point. I think what I'm really trying to do is generate lots of interesting beginnings. 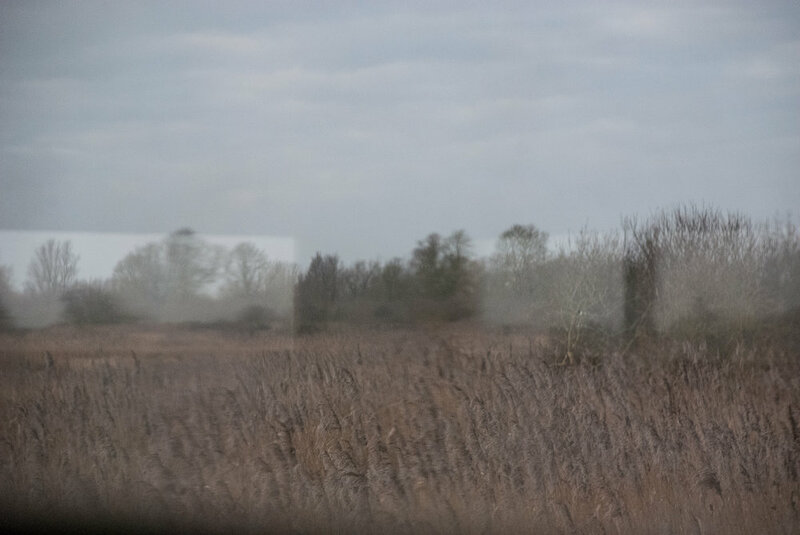 I am very excited to be starting a new collaborative project with artist Sally Tyrie and on Friday we made an initial research visit to Wicken Fen. This is one of the National Trust’s oldest reserves (acquired in 1899) and one of the last remaining un-drained areas of the East Anglian fens. It is an exceptionally rich wetland habitat. At this time of year, the dominant impression is greenness. The fen is a mass of tall sedges, grasses and reeds in brilliant emeralds and yellow greens, threaded through with traces of red and rust orange. Flashes of yellow, magenta, blue violet from the many marsh flowers – including orchids. It was gorgeous … but I am really looking forward to seeing the Fen in the winter when the green is bleached out and the underlying structures are exposed. I’ve visited Wicken before but it was a long time ago and therefore it was like discovering the place afresh. There is that initial phase of orienting yourself within a place – finding your way around, noticing what you notice, what you choose to focus on. As ever, I was consistently drawn to details – marks and traces – reflections, linear marks, particularly of the reeds and sedges at the water’s edge. But it’s interesting to experience a place with someone else – two pairs of eyes. Sally noticed things that I might have passed over – expanding my awareness, widening the range of things I noticed. We were drawn to the hides – both the structures themselves and the experience of looking out of them. As well as the viewing hatches, many of them had random holes in the walls (Birds? Knot holes?). So there were lots of ways of looking out, looking through, peepholes, slits, cracks. Worn and weathered plastic windows veiled and obscured the view – they simplified what you could see into shadowy outlines, veiling and obscuring as much as they revealed. –partial information, selective. My attention moved between the marks on the surface of the window itself and what you could see through it. No preconceived ideas about what work might result but lots to think about. There will be more visits, visual research, drawing and thinking with a view to developing work for an exhibition sometime next year. So expect to be hearing more about the fens over coming months. Visit Sally’s web site to see her work and follow her side of this collaboration. fabric, colour, texture, art, craft, creativity. This is a place to keep track of what's inspiring or interesting me, and how this shapes the thinking that goes into my work.